Greek-centric Ousia Opens at VIA 57 West in Midtown | thirsty. Our favorite “big, fat Greek family,” the Livanos Restaurant Group (Oceana, Molyvos, Moderne Barn) debuted its latest concept, Ousia in the iconic (pyramid building) VIA 57 West in Midtown West. Ousia, meaning “essence” or “flavor” (in Greek, of course) offers Greek-meets-Mediterranean cuisine curated by Executive Chef Carlos Carreto along with a phenomenal wine program powered by Director of Operations Kamal Kouiri. 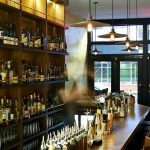 The vast restaurant is ideal for dining and socializing with friends and family – elevated “pub” booths, round tables and massive two-sided bar (to view one of many televisions). You’ll be mesmerized by the illusional floor. But we are here for the drinks. We get it, you can’t read Greek. Let us help you identify those limited-quality labels. When going gets tough around the table, consider these cocktails by Bar Program Director Johnny Livanos. Meet the PPP-erfect “fruity cocktail” ever. 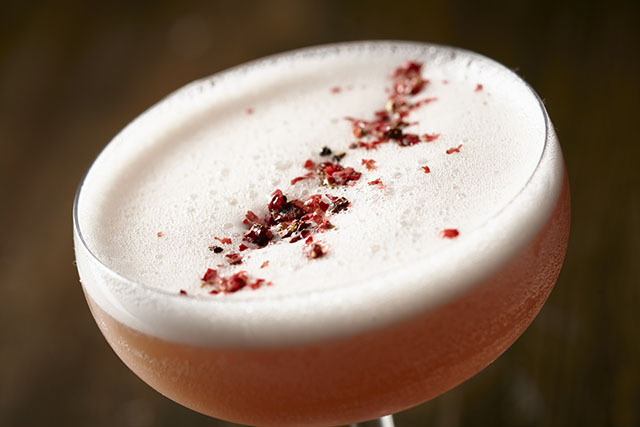 That is the PPP – Pisco brandy, pomegranate, pineapple and pink peppercorn presented in a coupe glass. Sip the Athena the Wise. 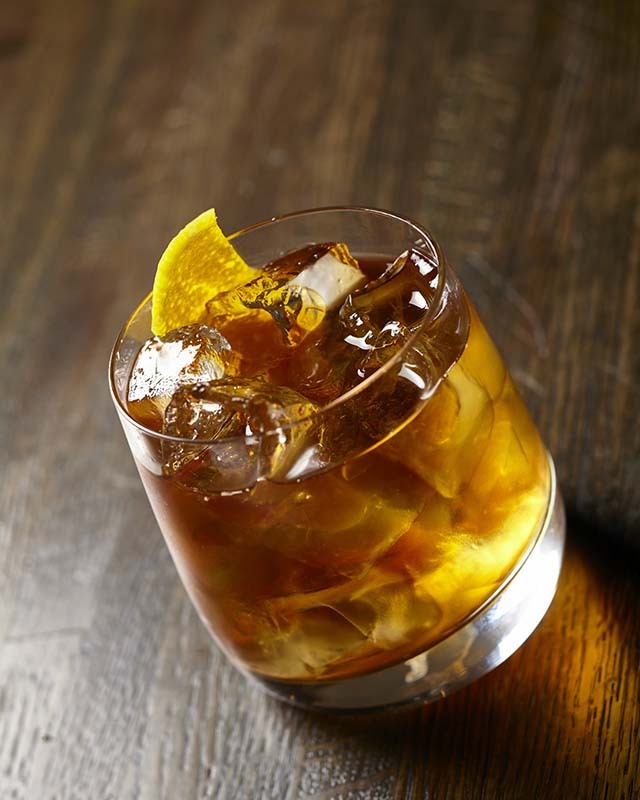 A twist on the traditional Old Fashioned, this smooth cocktail consists of bourbon, sweet vermouth and rakomelo, a Greek mixed-alcoholic drink made of raki and honey; served on the rocks in an Old Fashioned glass and garnished with an orange peel (or wheel like the OG drink). So you wish you were in Mykonos instead… Enjoy the Baklava Island. 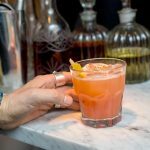 Poured over crushed ice, there is aged rum, walnut liqueur, allspice dram, honey and lemon…orange wedge, cinnamon stick and mint on top. It is strong and sweet, and takes all night to drink while the ice lengthens its impression. Take note of the tiki glass. Did we mention Johnny and brother, Enrico Livanos oversee Ousia? Yup, that’s third generation of restaurateurs taking the reins, and you can tell by unique fare and youthful flair. Much to come at Ousia.